"You think India is ready to rule itself?" IFC FIlms has debuted an official trailer for the drama Viceroy's House, telling the story of Lord Mountbatten's trip to New Delhi in 1947 to help transition India from British rule to independence. This is a story that has been told before in many other films previously, but we have another new take on it this year. 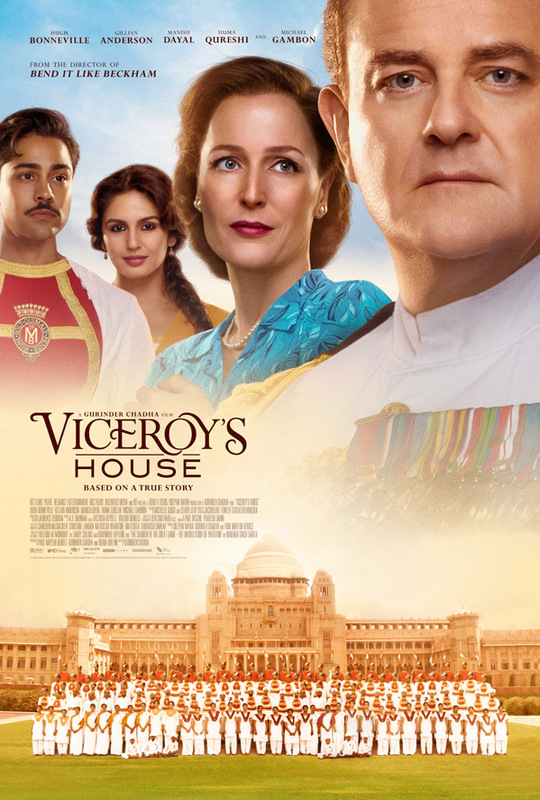 Viceroy's House features Hugh Bonneville, Gillian Anderson, Huma Qureshi, Michael Gambon, Lily Travers, Simon Callow, Manish Dayal, and Om Puri. The film premiered at the Berlin Film Festival earlier this year, and also played at the Belgrade Film Festival. It's goal is to focus on the division of India, and the creation of Pakistan, more than anything and how this destroyed the lives of so many different people. It's a good film, just not very memorable, but that's my take. New nations are rarely born in peace… India, 1947: Lord Mountbatten is dispatched, along with his wife Edwina, to New Delhi to oversee the country’s transition from British rule to independence. Taking his place in the resplendent mansion known as the Viceroy’s House, Mountbatten arrives hopeful for a peaceful transference of power. But ending centuries of colonial rule in a country divided by deep religious and cultural differences proves no easy undertaking, setting off a seismic struggle that threatens to tear India apart. Viceroy's House is directed by English filmmaker Gurinder Chadha, of the films Bhaji on the Beach, What's Cooking?, Bend It Like Beckham, Bride and Prejudice, The Mistress of Spices, and It's a Wonderful Afterlife previously. The screenplay is co-written by Paul Mayeda Berges, Moira Buffini, and Gurinder Chadha. This originally premiered at the Berlin Film Festival this year. IFC will release Chadha's Viceroy's House in select theaters + on VOD starting September 1st this fall. Anyone curious to see this?